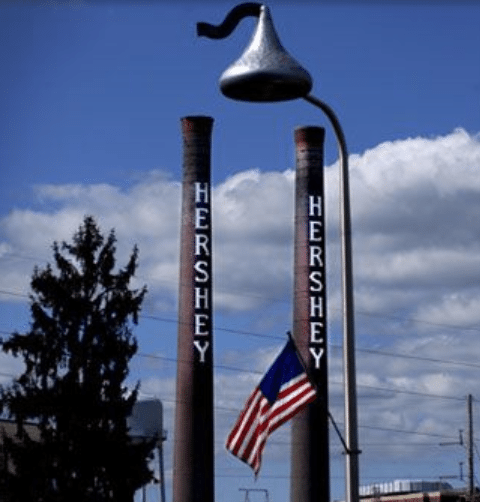 Back in 1963, we were tapped by a client working with a company called Line Material Company to do some aluminum spinning for the street lights in Hershey Pennsylvania. 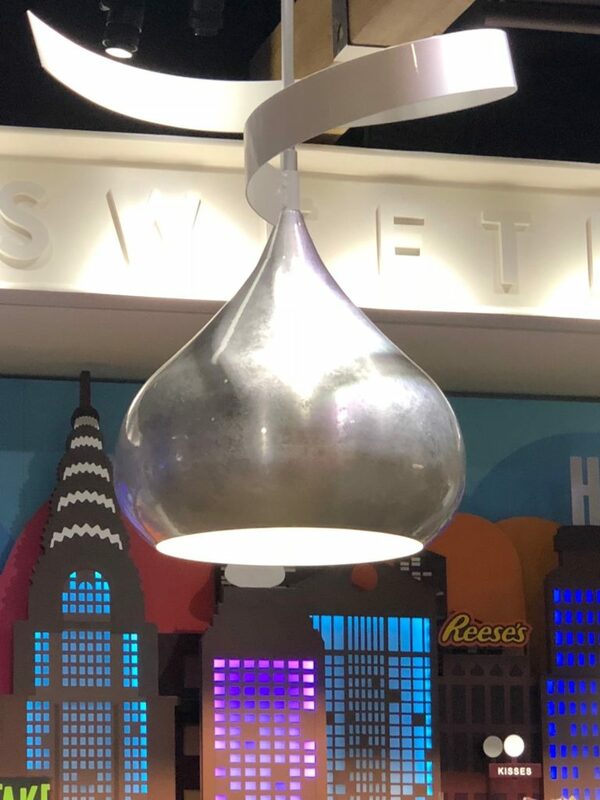 The fixtures were shaped like Hershey’s Kisses and still line Chocolate Avenue in Hershey PA today. Over the years, many on our team have taken our families to Hershey Park, taken in a show at the Hershey Theater or played a round of golf at The Hershey Country Club. We never miss an opportunity to enjoy a ride down Chocolate Avenue to see the Street Lamps. We love to see our work stand the test of time. Milton Hershey was all about making his products with American workers here in Pennsylvania. We are thrilled to be part of the Made in America movement. 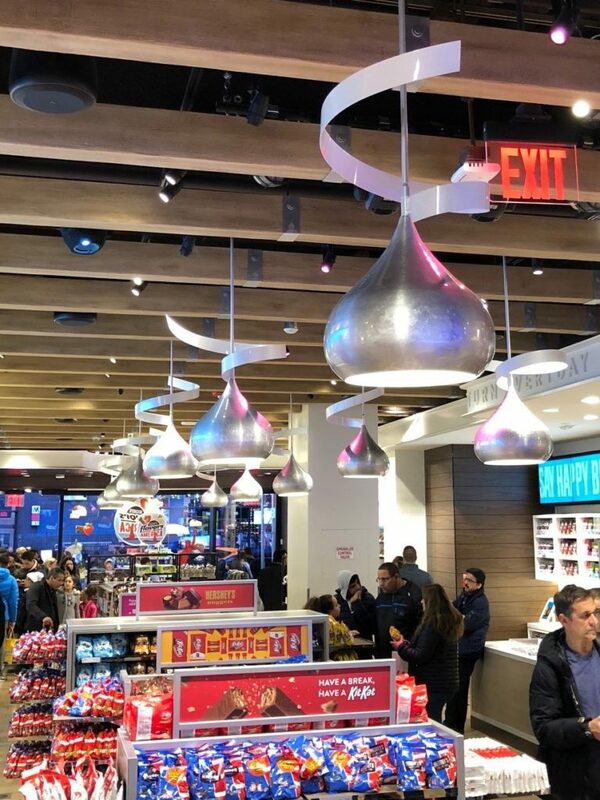 More recently, the Hershey Company decided to re-vitalize their retail candy store located in the heart of Times Square at the corner of 48th Street and Broadway. A local retail design group was hired to do some of the interior décor work for this store. The team over at Image One again needed a metal spinning manufacturer to craft the lighting fixtures. We are not sure how they found us but we got the call one day and were asked if we had any experience. So we told them the story that dates back to 1963. Spooky right?? We like to believe that there were other forces at work that guided them to us. Well, they sent us over the designs created in AutoCAD and together we fine tuned the specifications. Since the pendant lamp system was dropped from the ceiling, we agreed on a durable but lightweight material that is soft enough to be spun and had good tensile strength. We cut a few sheets of 6061 Aluminum at 0.100” to the appropriate size to make a prototype for our clients. They were thrilled with the sample and contracted us for 38 custom made lighting fixtures to be made. Our tooling department started off with an 18”diameter x 20” thick piece block of maple wood. 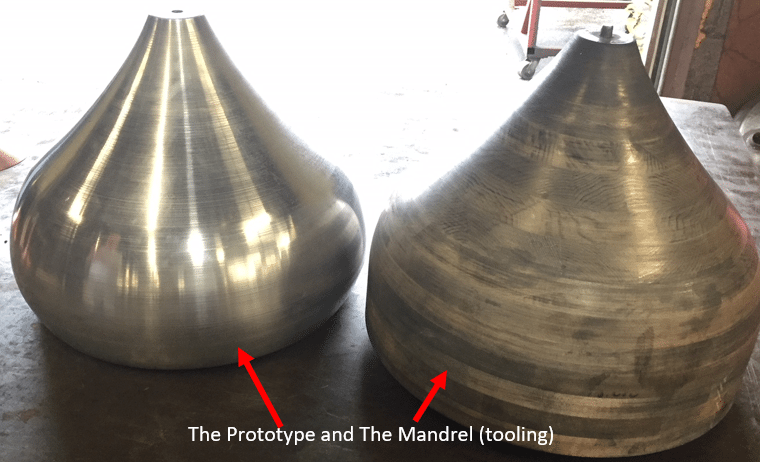 We fed the CAD drawing into our CNC Lathe to form the mandrel or mold for this project. Our materials department secured the aluminum sheets and began testing and cutting them down to pre-fabricated disks in preparation for our manually controlled spinning lathe. We take production scheduling very seriously. This was an important job and wanted to make sure we had a seasoned veteran lined up properly. Working a sheet of metal around a unique shape like these kiss shaped wood takes a skilled craftsman that knows his stuff. We have several of them employed by Charles Schillinger that have been with us for many years. We had Tony tackle this task since he knows the manual lathe so well. He kept the speed of the lathe at about 275 revolutions per minute which would allow him the right combination of speed & tool pressure for this type of aluminum. As you can see that there was a certain amount of necking required to elongate the flat disk properly. Here is a look at the finished product, pretty cool! Here is a nice look at eleven of the light fixtures with customers milling about that we took when we visited a few months ago. I’m a big fan of Kit Kats so of course we grabbed a few of those on our way out the door.